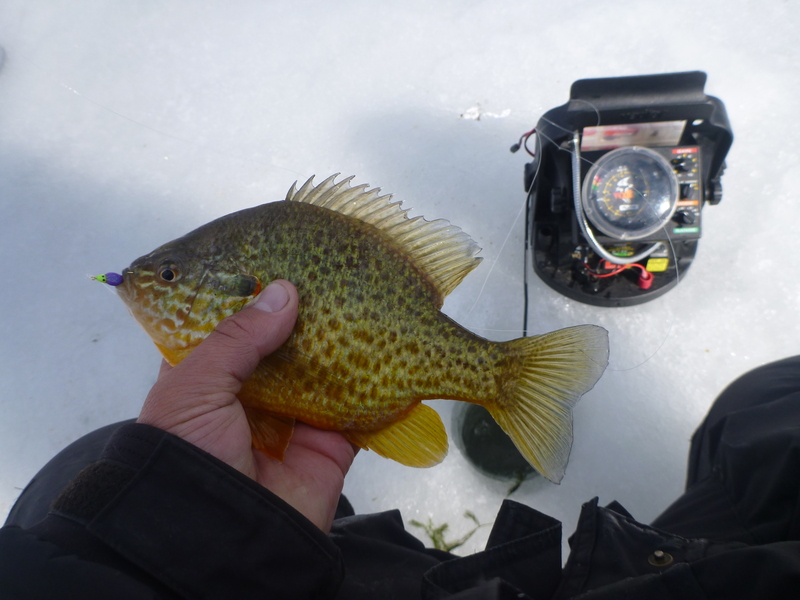 Although there is still fishable ice on several ponds and lakes that I frequent, knowing that Lake Champlain was only a day away or so from blowing out, it wasn’t a hard decision on where to go. Plus, fishing with company beats fishing late ice alone! If I had been out alone in similar conditions there is a good chance I would have gone home real quick! We experienced sun, clouds, rain, sleet, and wind. Not ideal conditions for fishing! I met up with a buddy in Richmond to carpool at 5:30am. We were at the spot by 6:30 and fishing shortly after. The fishing started fairly quick with a mix of mostly pumpkinseed and bluegill but there were a few keeper crappie mixed in! It didn’t take long for disappointment to kick in… The fishing slowed quickly. I wouldn’t say they shut off but you would have been hard-pressed to catch more than 2-3 out of a single hole that held fish. It seemed like they learned quick what not to eat! I ended up switching just a lot looking for what was working. The best combo I found all day was an orange vertical jig tipped with three spikes. Throughout the day, we made two big moves from the starting point. The first was north towards a swamp thinking that they were staging up for the spawn. At first the move seemed good. We caught fish after fish for about 30 minutes but the glory was short lived. The fish disappeared and were no where to be found. We returned to the starting point and being that it was around 2pm, we decided to make another move back towards the car. underwater camera. I only saw two fish. Both northerns! I figured we were going home early… My buddy and I talked about where or if we should make another series of holes. It was a good thing we did because we found decent fish! We punched six holes total. I checked two holes and in the third I think our conversation went something like “any fish?” and my response was “umm… yup. 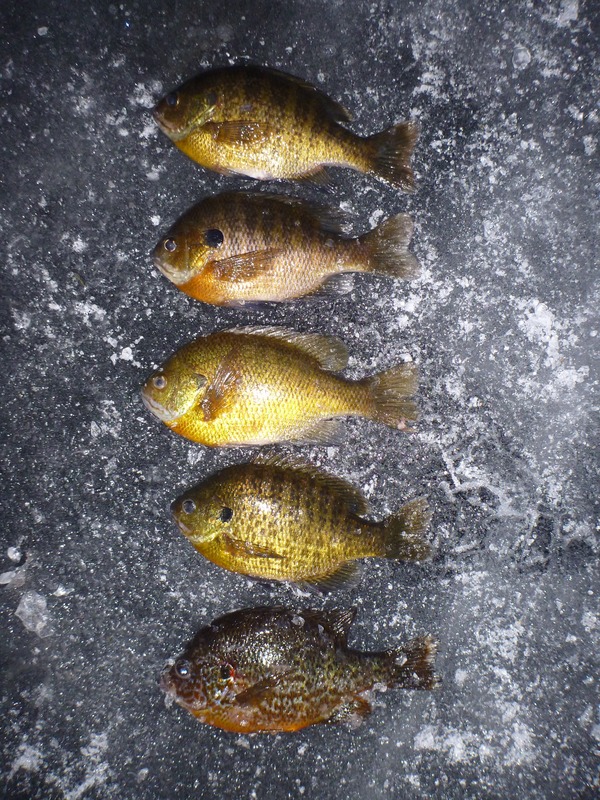 a few pumpkinseed. I mean a lot of seeds… and a ton of bluegill, and bass, and CRAAPPPIIIEEE! Get your vex and jig stick!” Wouldn’t you know it, first drop, my buddy pulls a thick 12″ crappie! We fished for another two hours and punched lots of holes that yielded lots of fish. It was a good end to a day that threw us quite a few curve balls. 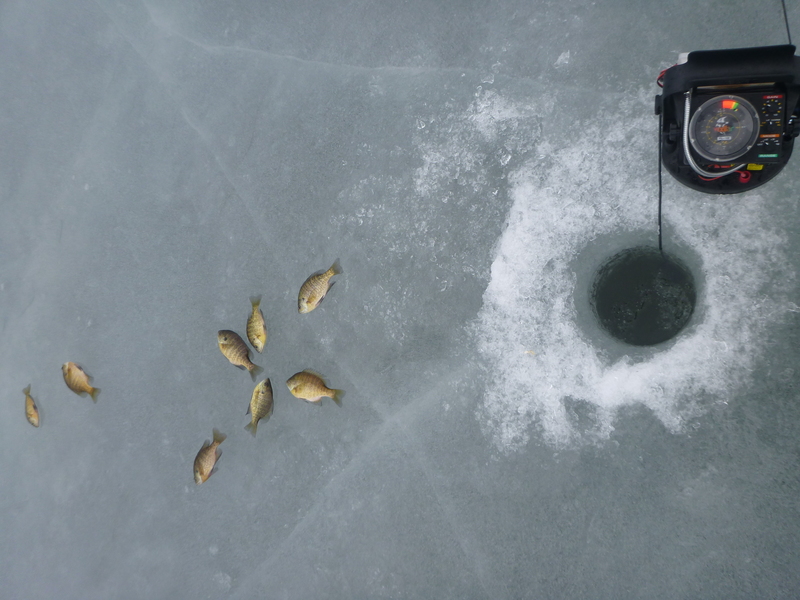 We worked hard for our fish and as we punched the last of our holes you could see that the ice was very close to being done. We were pulling out huge chunks of shattered ice coming from the bottom layer and kicking off an easy 5″ of honeycombed ice on top. With a total of 10″ of ice that didn’t leave much room for quality ice between. Lake Champlain was good to me this year. Is it December yet! I miss it already! I fished Lake Champlain on Monday from 7am until 4:30. The weather was picture perfect as long as you don’t mind the ice melting! There was little to no wind and it was sunny. I ended up fishing the afternoon in just a long sleeve shirt. Most of the other guys on the ice with me took their fishing suits off it was so nice! The fishing was quick at times and slow at others. The bite at first light was apparently better than any other time throughout the day and wouldn’t you know it, I missed it! The fish didn’t move far all the day. We spent most of our time spread out over small area but at times we reached out when the fish were not active looking for where they went. At these times, I would walk around with my Aqua Vu Micro underwater camera and search. I found that the fish didn’t go anywhere… They were either suspended just below the ice or sitting right close to the bottom and not moving. I wouldn’t say we struggled to catch fish but it certainly was not the best day on Lake Champlain. 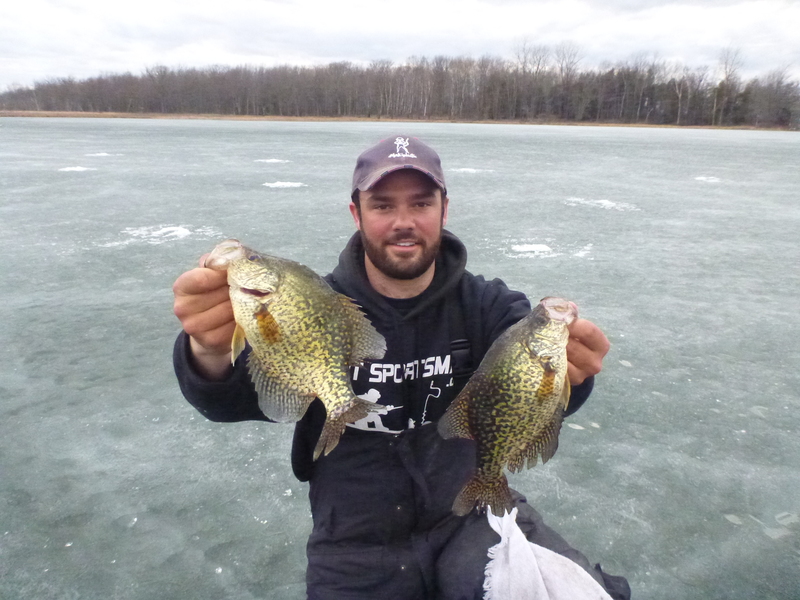 I was able to pull some nice crappie that were pretty spaced out throughout the day but little chips were frequent in most holes and everywhere on the camera. It seemed like they were more lethargic than normal whenever I would see a decent sized fish. The best color today was anything heavily colored in green. I tried both horizontal and vertical with similar success but stuck it out with the vertical. I find myself getting better hook ups when I am fishing fast. I switched out many times throughout the day from maggots to plastics and both worked. I had good luck using the Mini Draggi by Maki Plastics in white or two spikes! I got on the water at 6am and it was snowing sideways. I punched out a weed bed on an inland pond that had held fish the week before and got set up for the day. 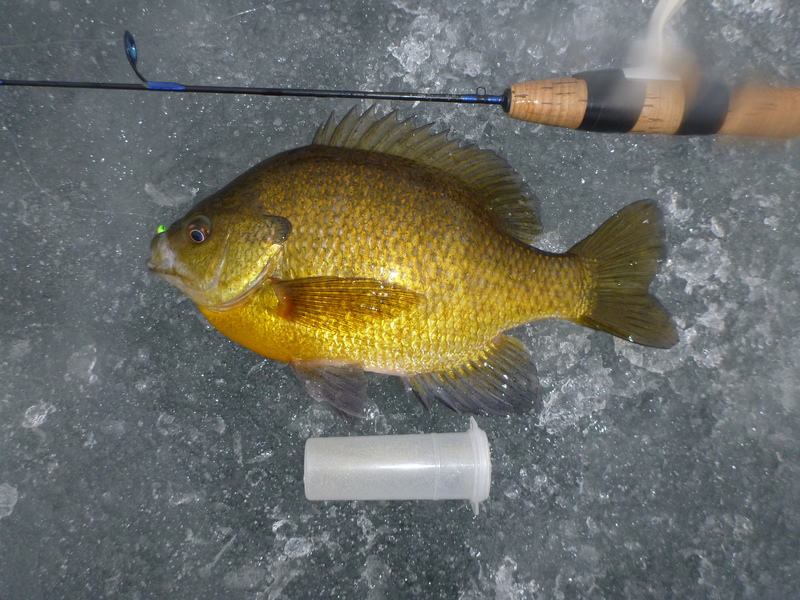 As soon as the dark started to fade, the panfish started coming out of the weeds. For 45 minutes, the bluegill came as fast as I could get down. They were suspending above the weeds at varying depths depending on how tall the weeds were. 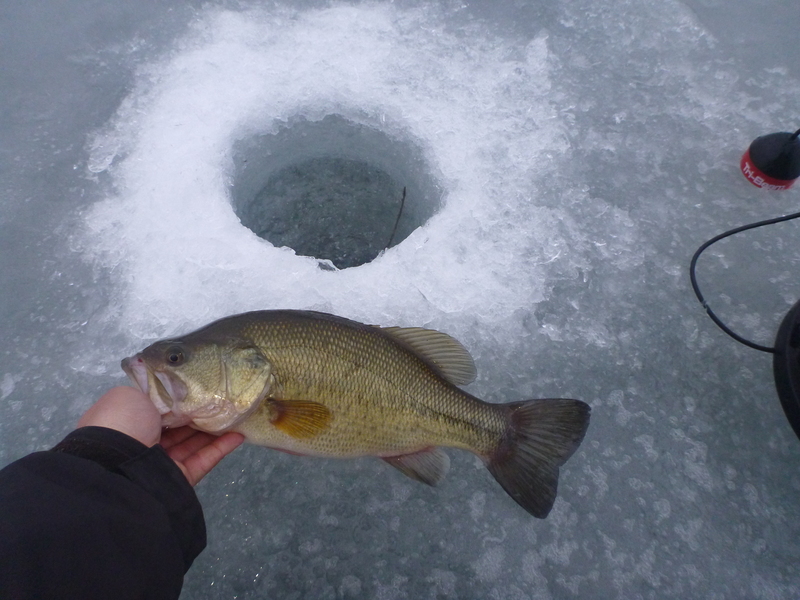 It ranged from 6″ to 4 feet below the ice. Once the sun was completely up, the fish slowed but were still cruising in less concentrated corridors. They began to go down into the weeds to settle for the day around 9am. At this point, we began moving around more searching out fish in the weeds. The bite was pretty bad at this point so we made a big move to the other side of the lake after an hour of limited success. The second spot we hit held larger numbers of fish so we stayed for a few hours. The bluegill were half in the thick weeds and half right at the surface of the weeds waiting for a passing meal. 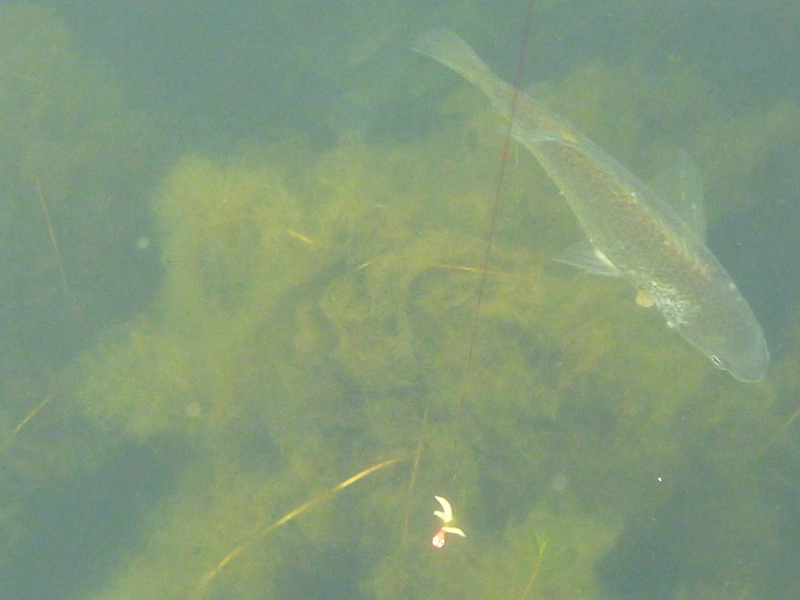 The pumpkinseed seemed to be hanging deeper in the weeds and far less active. It seemed like for the fish that were in the weeds, the harder that I pounded a jig the more fish I caught. They were very active but because of the dense weeds, the fish didn’t come in large pods as they were basically staying put. After struggling to catch fish for too long, I decided to head back over to where we began the morning. Because I had been fishing this weed bed quite a bit lately, I had a good idea of what holes would produce. I have dropped my Aqua Vu camera down most of the holes at least once now and have identified certain holes that have openings in the weed canopy. As soon as I started fishing, I was catching fish. I caught over 25 fish, mostly pumpkinseed, between the first two holes I kicked open. I called the troops over thinking that I was on a good bite! I continued to catch decent numbers of fish but not great. For two hours we all made rounds in the holes from the morning session. The fishing was slow and lots of bass were swimming around below us. Around 5pm, there was only two of us that were the only one still motivated to stay in hopes of a night bite. As the group of guys were walking off the ice after calling it quits, the fishing picked up. My buddy and I caught good numbers of fish for another 20 minutes then he had to head out for some family time. I stayed in a cluster of 5 holes until dark and pounded on them. The evening bite has been really good at this spot. 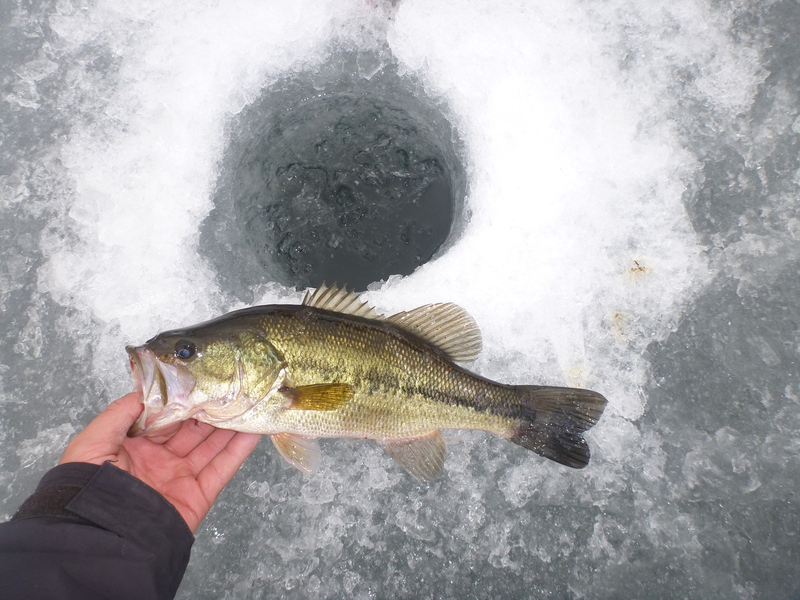 The smaller fish disappear for the night and every gill that comes out of the hole seems to be over 8″. I cant wait to get back on this spot again! The fishing has been top notch! 2-24-12 – Best Day Yet!!! I didn’t get on the ice today until 1:30pm. I knew with the storm coming that I didn’t have much time before the roads got slick. A group of us are headed to this inland pond in the morning so I wanted to get a good scouting report. 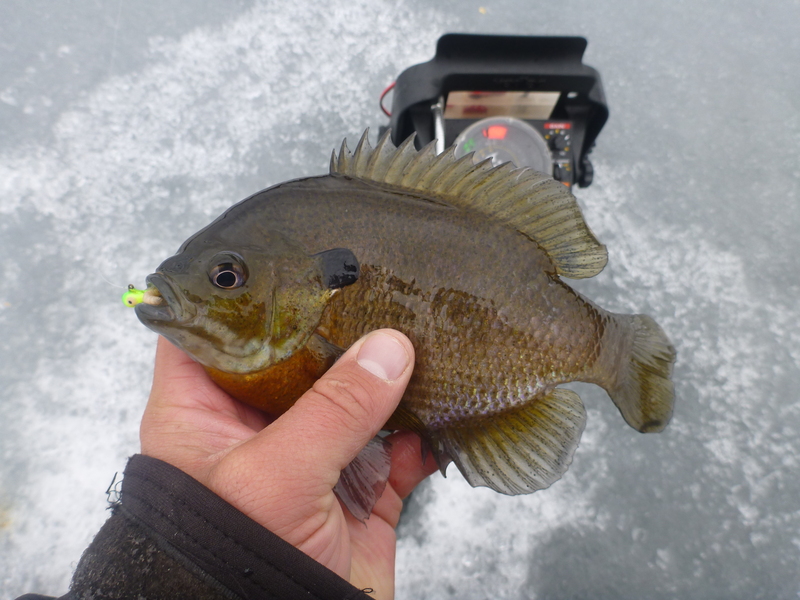 We have been catching bluegill very consistently but we wanted to expand our fishing zone and search out fish that have yet to be pressured this season. All I can say is it was a success! 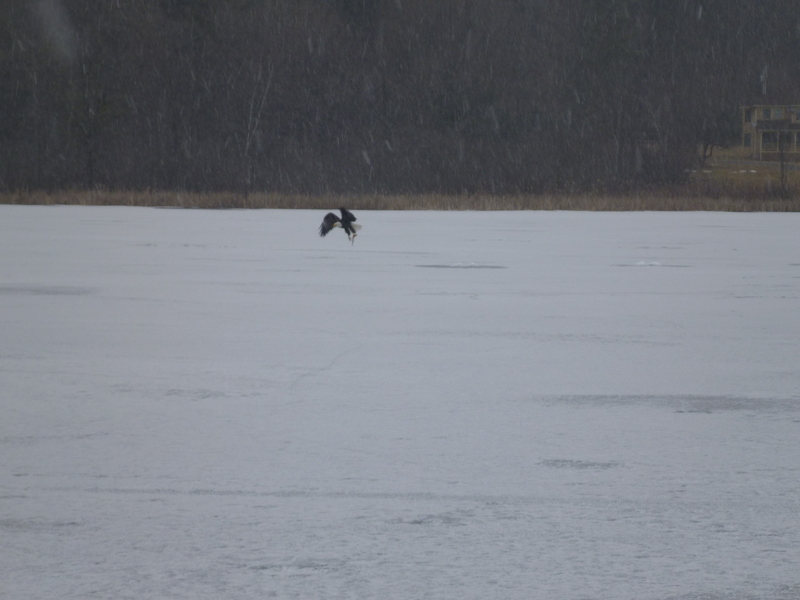 When I got to the spot there was an eagle eating some fish remains. This bird was there last trip as well so I tried the best I could to get a decent picture. I will bring my nice camera tomorrow and try to get a better shot if it comes around! I punched a series of holes where I guessed the fish would be. I dropped my Aqua Vu camera down the hole and got excited for a minute. There were tons and tons of fish! Unfortunately, they were all shiners. I took a quick video that is not great quality but it shows the abundance of them that I saw throughout many of the holes today! 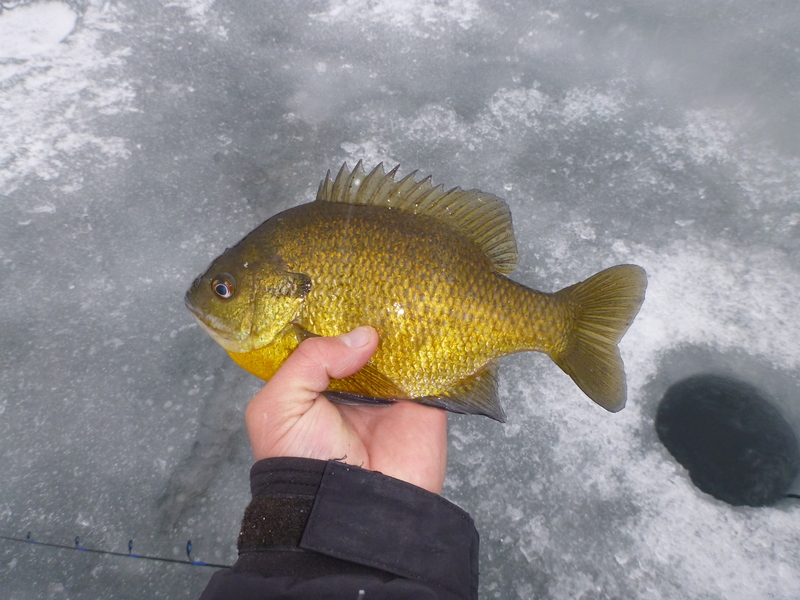 It took only three holes to find some bluegill and it was on. Fish after fish, I probably pulled 35 – 8-9″ gills out of the first hole. I didn’t want to educate all the fish today so I moved on. For the next 45 minutes I couldn’t do anything wrong. The fish liked every color I tried bait or no bait. I thought to myself, I must be crazy to leave but I want to go find more fish! I packed up and headed down the lake to a different spot. When I got to the fresh weed bed I didn’t find anything but 10″ holes so I knew If there were fish I could get them. I punched holes in a large area pretty well spread out. The water was deeper than I wanted but I was marking fish so I dropped down. I quickly got the interest of a fish. It was a bass. I thought it was fun having them tear the line off my reel so I hopped around and caught several others ranging between 12-17″. They were super aggressive compared to others that I have caught this season. After a few of them I decided I should get back to my mission. I moved in closer to shore from where I was getting the bass and I found good bluegill. The depth ranged from 3-10″ with very little weeds in the majority of the holes. This was also where I got most of my big gills. I caught one gill that was 10 3/4″ but the picture didn’t save on my camera unfortunately. The one pictured below was 10 1/4″ so it still a hog. Tomorrow, if we can find the fish, we will get some better pictures! When we got to the second bay, we headed for where I fished on it the day before. 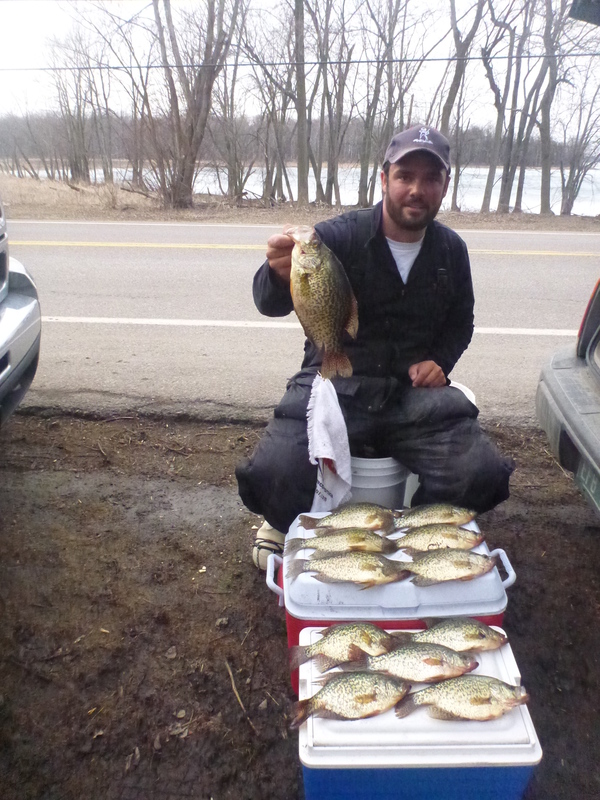 We quickly whacked two crappie then went dry for a bit. Although all of us were pulling fish in most holes the fishing was slow. We kept punching holes and moving around the spot where we had been having luck. 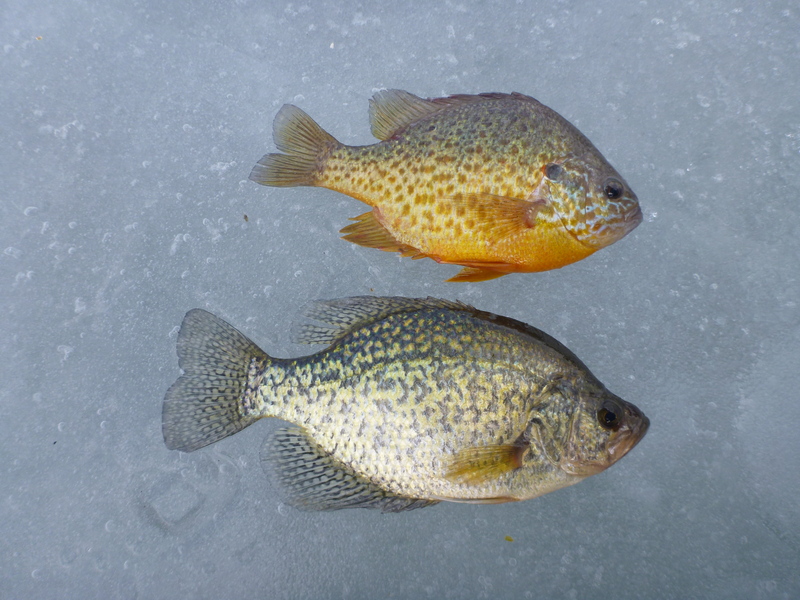 Eventually, we got on a few spots where there were better numbers of bluegill and pumpkinseed. The majority of what we caught all day weren’t huge but good sized eaters none the less. I had to head out earlier than I usually would to get to work. I was on the road at 1pm and disappointed with my day but it was still great to be out! I hope that the fishing turns on before all the ice is gone! When I left there was quite a bit of water puddling up on top of the ice but there were people driving full sized trucks out. Should be a while yet (I hope)! Thought it was going to be a crappie up until it made its first run! Two nice fish at the end of the day.